The Pew Foundation has a new survey out that there is an increasing level of concern in the Muslim world about Islamic extremism. This survey was in fact taken before the fall of Mosul in Iraq to ISIS - which I guess, now is just IS (The Islamic State). On a side note, I'm glad about the name change, as Isis reminded me of the nice Egyptian goddess of health, marriage and love, whereas the new ISIS is mostly deadly, brutal, and tragic. In any case, I think respondents would be even more concerned now with the all the recent developments in Iraq. Before we look into some of the results which uses the word Islamic extremism frequently, please also read this excellent article by Nathan Lean: Stop Saying "Moderate Muslims". You Are Only Empowering Islamophobes". And most Nigerians have an unfavorable opinion of Boku Haram - a really nasty group that kidnapped school girls and have been bombing market and other public places for the last few years. In fact, there was a bombing just this morning in northern Nigeria that killed 18 people. And Pakistanis don't have much love for the Taliban either (and this holds for all flavors of Taliban). However, it will be interesting to see the break-down of numbers by provinces. On the one hand, I can see the Taliban enjoying broader support in the northern K-P province, but on the other hand, Peshawar is also a routinely struck by their bombings. I wouldn't be surprised if Baluchistan has higher support as there is a strong separatist movement that is not linked with the Taliban, but may have sympathy for the (current) enemies of Pakistan military. 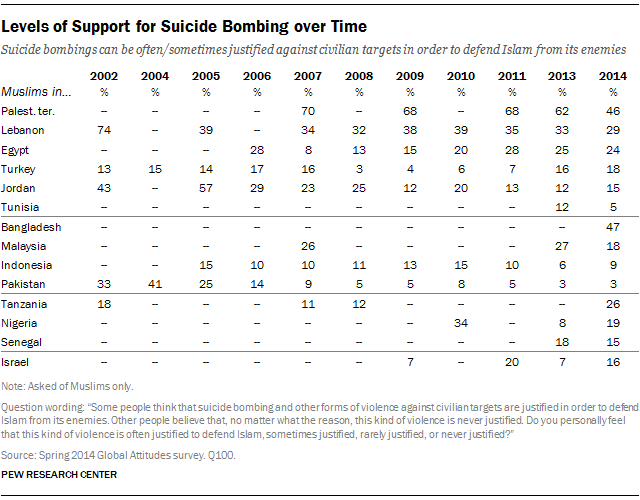 And here is the level of support for suicide bombings over the last 12 years. This is a good reminder that these views, of course, are driven by circumstances. Lebanon and Pakistan - both have been rocked by internal violence - have the most dramatic shift in views, with Lebanese support for suicide bombings going down from 74% in 2002 to 29% in 2014, and in Pakistan from 33% to just 3! So - next time when Sam Harris or Pamela Geller or Ayan Hirsi Ali start making normative claims on these issues, just point out that Muslims not only have diverse positions on this topic, but their positions also change with time (and then re-read Nathan Lean's piece on problematic use of "moderate Muslims").